Thanksgiving is a celebration of all the things we are grateful for. A celebration of the pilgrims and Native Americans feasting together. I know history gets dark during this period of time but for Elementary students we chose to focus on the positives. In later years we will address the full history that surrounds Thanksgiving. Pilgrims traveled from Plymouth England and arrived in Massachusetts on large boats. Evan-Moor had a story to read about the Pilgrims journey. What they ate, how many people were on board the Mayflower. It wasn’t too long but just enough to give my kids a glimpse into life on the boat. Paper dolls were a huge hit in our home!! After we read about how the Pilgrims traveling across the ocean the kids used the dolls to re-enact their travels. I had pilgrims sleeping on the floor for days! During our reading time I paused to ask, “What do you think the Pilgrims thought about sleeping on the floor/eating biscuits/not having a bathroom/ etc.” I love using questions to help get my kids to think and internalize what they would do or think about in a situation. Later on I overheard the “Pilgrims” complaining about sleeping on the floor again and how they couldn’t wait to get to land for more Ritz Bitz. They cannot even fathom what life was like nearly 400 years ago and to be honest I can’t either. I need my fridge, bathroom and electricity. Spending some time with the Pilgrims helped increase our families gratitude for the simple things more than I thought it would. As my kids are getting older I am more and more grateful that we have always taught our kids about manners and behaviors that are appropriate for different situations. Thanksgiving dinner being one of these situations. 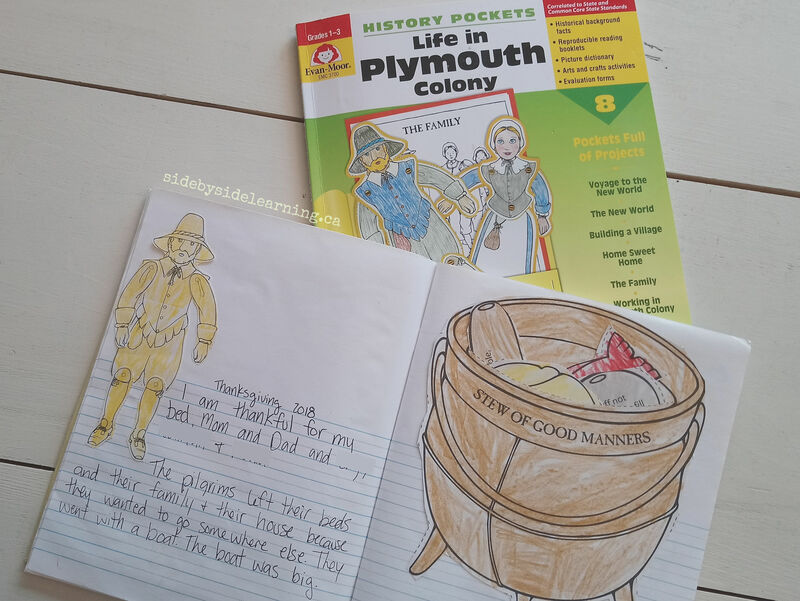 Evan-Moor had a fun page to help teach manners or give your kids a quick review before heading over to a relative’s home for dinner. We colored the Cauldron and each of the different vegetables. Once everything was colored we gathered to talk about what each vegetable had written on it and why that was important. A few of them were a tad outdated but I still taught what rules the pilgrims had and the small differences that we have today. One of the veggies was empty, waiting for your own rules. I was pleasantly surprised that my kids quickly knew what rules to add. I asked for one thing that we need to remember during dinner time but they filled the entire vegetable up with a couple of rules. During Thanksgiving dinner the kids even managed to remember most of the rules and I only had to stop them from correcting their cousins actions a few times. Kids, always paying more attention to what others are doing than themselves. Each holiday I try and have at least a week where we focus on the holiday, why its important, how we celebrate it and what can we learn from it. 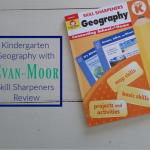 Using Evan-Moor was a quick and easy way for me to teach the kids about Pilgrims and their journey to the America’s. The information is great. It is loaded with information and hands-on learning activities to help your kids learn about and comprehend history. 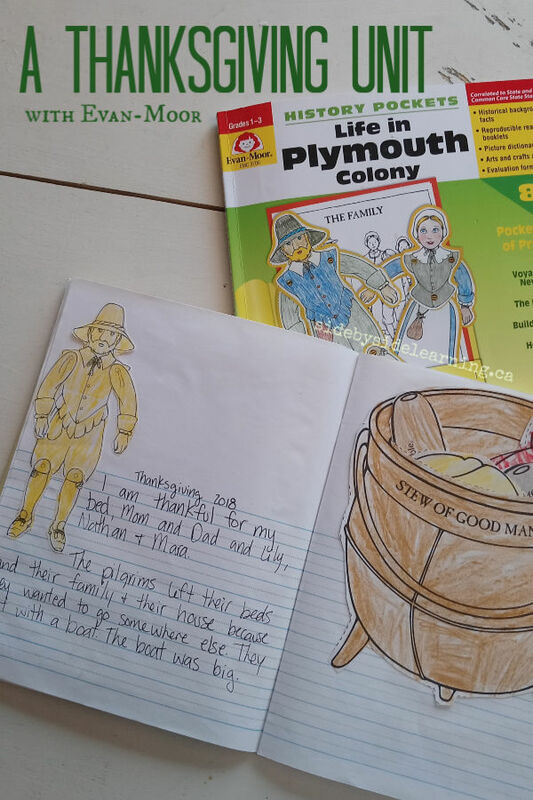 History Pockets: Life in Plymouth Colony, Grades 1-3 is a wonderful resource to add to your Thanksgiving or History Units. nice little unit for American thanksgiving. What a sweet and helpful post! I agree that teaching our kids to be grateful and have manners is priceless. 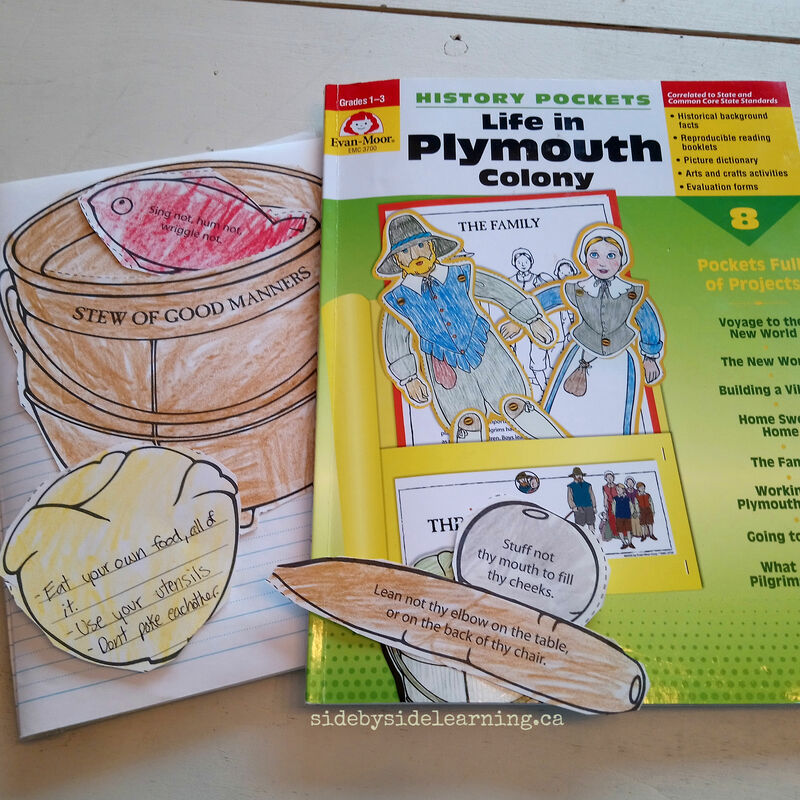 It is so cool that you could tie those life skills to this history pocket! 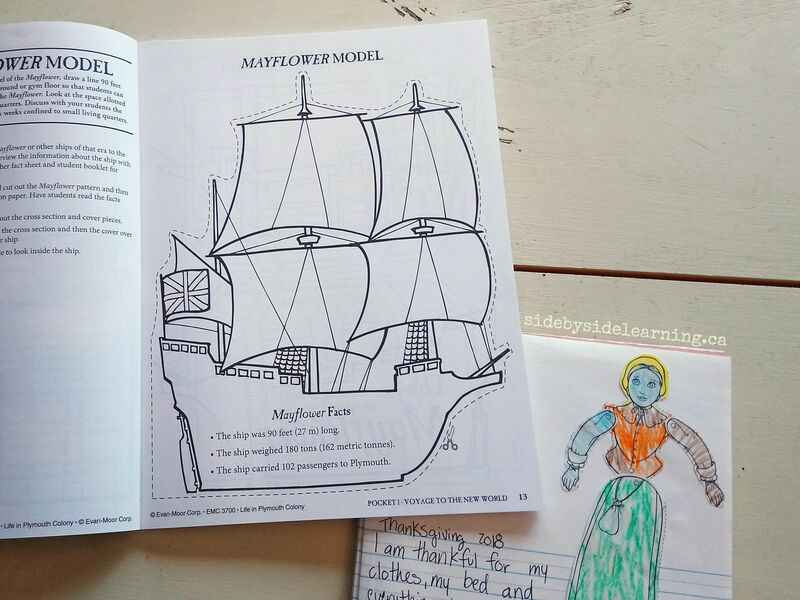 My Kids will love playing with the paper dolls and learning more about pilgrim life. 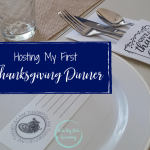 You have inspired me to use this for our thanksgiving unit this year!